Eingyi is a deformed pyromancer who is dedicated to serving the "Fair Lady", Queelag's Sister. Eingyi is a pyromancer from the Great Swamp but he was banished after creating poison based pyromancies. The Fair Lady sucked the blight pus out of him and many other residents, making herself sick in the process. This action so greatly affected Eingyi that he became her servant and carries her eggs to show his devotion. 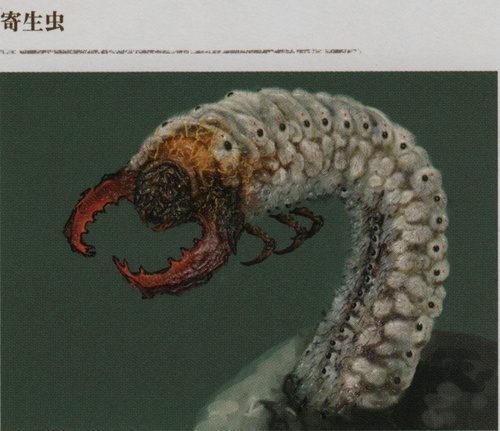 Although Eingyi is devoted to Quelaag's Sister, he cannot speak her language; everything he knows about her and her past is through observation and extrapolation. Eingyi blocks the entrance to Quelaag's Sister. He will ask the player if they came to serve his master; the player must answer yes to access Quelaag's Sister, and thus, the Chaos Servant covenant without killing him. 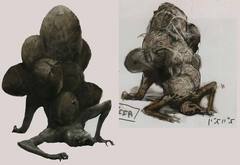 Eingyi is initially mistrustful of the player, however, if the player becomes infected and obtains the Egghead status, or speaks to Quelaag's Sister while wearing the Old Witch's Ring, he will see the player as a true servant and will open up extra dialogue. Well… that head of yours… Nothing seems to help, does it? I still have medicine… go ahead and use it. Now now, no need to fret about it! Things will be fine… one day! You! You would betray us?! Have you developed an interest in Pyromancy? You, you speak the tongue of the Fair Lady? … Well, do not be rash with your pride. You have yet to earn my trust. If you try anything funny with the Fair Lady, there will be hell to pay. In all honesty, I am envious. What comfort can I offer, without speaking her tongue? … Now… you're just like me… Your dedication is fully apparent. Only, well… Your head looks awful… Why not try this? I've no use for it any longer. Incidentally, do you have an interest in pyromancy? If you have, I shall share my flame with you. Worse than Undead, we are diseased, and unwanted. Like the grime of the Great Swamp. And swallowed the great Blightpus, despite Mistress Quelaag's orders to the contrary. Below us lies the ruins of the legendary city of Izalith. There, the Molten Giant watches over the Flame of Chaos. Our Fair Lady, and Mistress Quelaag, fled from the ruins. Have you heard of Lost Quelana? An inhuman witch, who wanders the Poison Swamp. Only no one has eve seen her, so who really knows? But what if she is another of the Quelaag sisters? Our Fair Lady would be greatly comforted by her presence. Poison Mist Unique pyromancy crafted by Eingyi, considered a heretic even at the Great Swamp. Eingyi became an egg-bearing Undead who serves a deformed young girl who speaks an unintelligible tongue. Toxic Mist Unique pyromancy crafted by Eingyi, considered a heretic even at the Great Swamp Create intense poison mist. Why was Eingyi driven from the Great Swamp? One only need cast this pyromancy, a perverse diversion from the art of fire, to find out. Egg Vermifuge Bitter, sour chestnut. Naturally, these chestnuts are forbidden, but are allowed under certain circumstances.